Part Used: Underground Stem And Roots. Common Name: Aconites, Indian Atees. 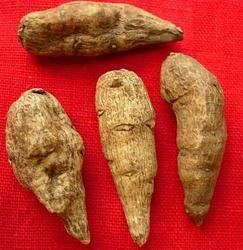 Being a prominent firm, we are engaged in offering a distinguished assortment of Aconitum Heterophyllum Roots. Ativisha Aconitum heterophyllum or Indian Atees is a specific Ayurveda herb which even being a part of poisonous group of herbs; it is very safe to use.It is the drug of choice for all pediatric health problems. Applications: An effective remedy for phlegm, inflammation of the internal organs, piles, itch, abdominal enlargements, rheumatism and for enlarged cervical glands. Decoction prepared using the herb is used in stomachache and bowel complaints, boils, skin eruptions etc. We Also Deals in Small Quantity. Common Name : Aconites, Indian Atees. Part Used : Underground Stem And Roots. Habitat : Present in alpine and sub-alpine region of himalayan region at altitudes between 1, 800 - 4, 500 m.